The London Fitness Tours are the only London Tours that look after your wellbeing as well as make you discover beautiful and unexpected parts of London. Whether you are a sporty person and don’t want to give up working out during your stay in London, or you are a curious and dynamic type willing to try different ways to explore the city or you are looking for new ways to stay active and fit you must try this! The combination of music, exercising and discovery is not only a unique way to see London but is also a great antidote to stress and fast-paced life. 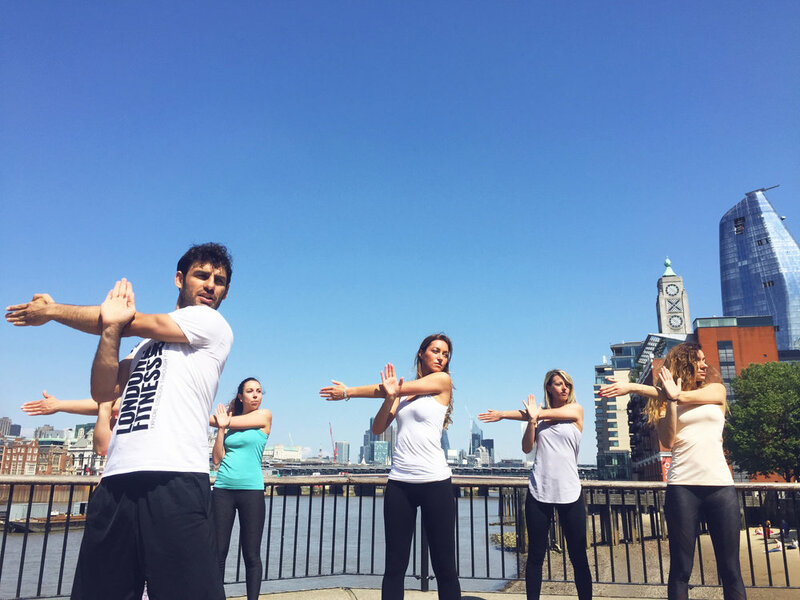 Explore beautiful and unexpected parts of London whilst doing an on-the-go workout to the rhythm of the best London music with intimate groups of maximum 6 people or on a private session (on your own or with a group of friends). Our fitness tours last for 2 hours and we walk an average of 10,000 to 14,000 steps. During the tour we listen to interesting stories and anecdotes of the areas and we exercise along relaxing canals, beautiful nature or amongst unexpected wildlife as well as seeing some interesting historical or cultural gems. The tours are ideal for medium fit people, nothing too strenuous or intense. WARM UP SESSION: 10 minutes of full body warm up with a “how to walk” session to learn how to power walk and use our whole body as we do so (from breathing, to posture, to gait). Walking is natural but not obvious. With our dynamic walk technique you can change the way you walk forever and exercise without realizing, just by applying it to your everyday life. ON-THE-GO WORKOUT: we will alternate a dynamic walk with fun and engaging exercises that use different elements of the city. This is combined with historical, cultural and music explanations of what we see along the way. STRETCHING SESSION: all tours end with a relaxing stretching session overlooking a nice panorama or in a calm natural space with soothing music. Run by fitness guides (combination of personal trainer and tour guide), our Fitness Tours are like no others as they combine art, culture, lifestyle, music and exercise in a very unique and fun way. Forget wordy explanations and long stops, these experiences are tailored for the dynamic traveller who wants to make the most of everything that London has to offer without wasting time and whilst keeping fit. As the first ever concept of Cultural Fitness our tours have received lots of attention from press and media, with excellent reviews on the Telegraph, Lonely Planet, Grazia, Marco Polo, Health and Fitness Magazine, Global Wellness Institute and many more. Exercise through Afro-Caribbean vibes, street art, local markets and nature. Exercise along relaxing canals, breathtaking views and picturesque harbours and parks. Please wear trainers and comfortable clothes, anorak (in case of rain) and no heavy backpacks or bags. Fun, sporty and cultural. A good way to start the weekend in arts and cardio. Savio brings you around and makes your heart go up while you learn about (in my case) Shoreditch. You are flying around and the intensity increases; it is not about running or working out, and it is not about learning about street art. It is about intensely connect with the city, with your eyes your body and your heart. Cheers Savio! Highly recommended. Art, Exercise and Music: the perfect way to discover a City! The tour is richly varied, a perfect blend of exercise and culture, unveiling a wealth of historical and contemporary art and architecture all set to a rich and perfectly researched musical score.It doesn't just stop there, as Unexpected London rounds up the experience by sending you all the photos and musical links to deepen and remind you of the immersive journey. Unexpected London offers a completely fresh take on city sightseeing, bravi!